Playing Grim Fandango has been a long time coming for me. Over the years I’ve heard it described as not only one of the best games ever made but also one of the funniest. Being familiar with several of Tim Schafer’s other games (Psychonauts, Broken Age, even Brutal Legend), I came into Grim Fandango Remastered already expecting to enjoy the quirky writing and world. However, while the game didn’t disappoint in those respects, the puzzle-ridden gameplay didn’t exactly make it worth the wait. 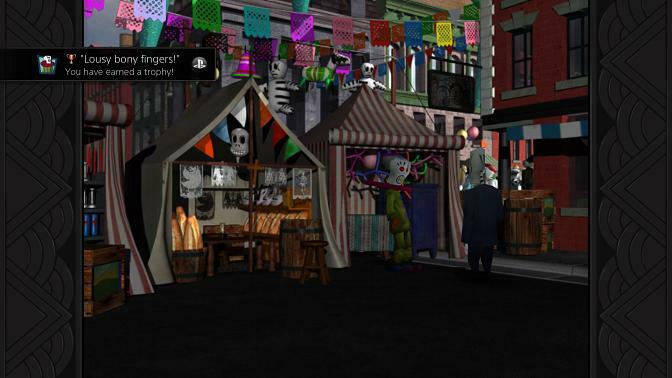 No bones about it, Grim Fandango Remastered is one of the hardest games I’ve ever played. So hard that I could not beat it without using a walkthrough for its entirety. 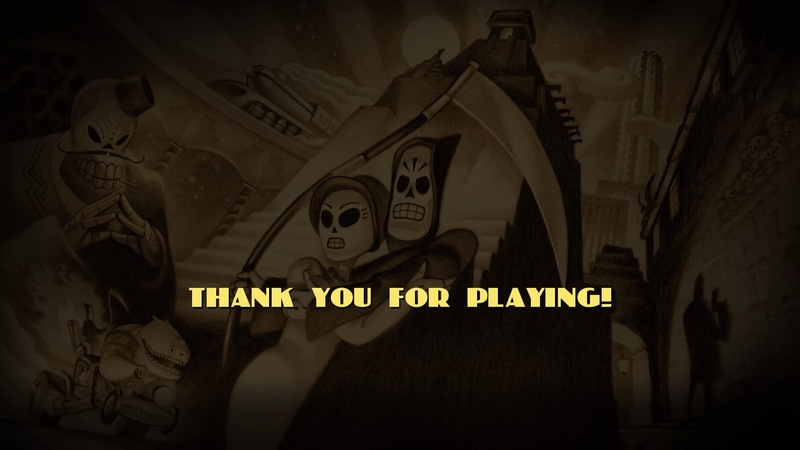 For me the ends justified the means: Grim Fandango’s often amusing, sometimes brilliant storytelling is often undermined by dated, frustrating gameplay. This is Manny Calavera. 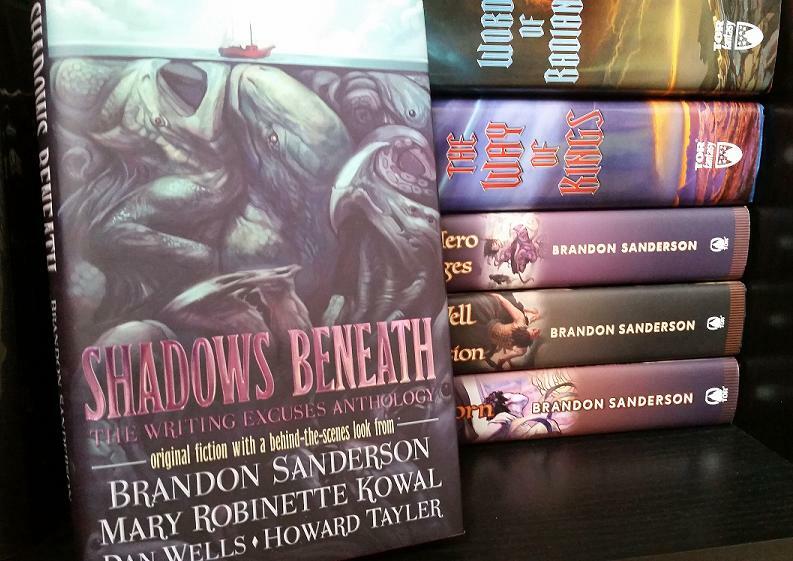 He’s just one of the many interesting characters who inhabit the Land of the Dead. For as odious as I found the puzzles, the one thing I can’t fault Grim Fandango for is its premise. 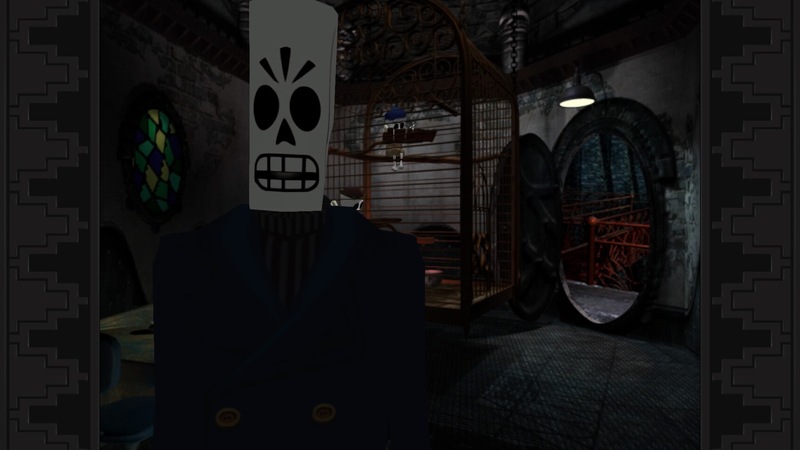 You play as Manny Calavera, a down-on-his-luck salesman for the Department of the Dead who offers his recently deceased clients luxurious travel packages to the Afterlife. When a beautiful client (beautiful for a skeleton, anyway) named Mercedes Colomar enters his un-life, and then doesn’t get the package her records show she deserves, Manny suspects corruption in his little slice of the Land of the Dead. His journey to find her, and in turn find his own hereafter, takes him across a whimsical world heavily inspired by film noir and the Mexican Day of the Dead. The setting for Grim Fandango Remastered has a setting unlike any other. A true Double Fine specialty. The setting and story pitch — a Día de los Muertos/Aztecian aesthetic laid over Casablanca — immediately set it apart from any other game I’ve ever played. Or any story I’ve read, for that matter. Grim Fandango’s Land of the Dead is an intriguing take on the idea of “what happens when we die?” with lots of clever twists that make it original. Simple stuff like the premise — the Grim Reaper is a salesman — piles on the charm, while something like how the guns in this world shoot seeds, not bullets, which destroys the bone-ified citizens of the world, are the kind of far-out worldbuilding details I love. I wanted to find out more about the world, which drove me to seek out as many conversations as I could with the colorful folk who inhabited it. From sarcastic secretaries and poetry-slamming yuppies to an adorable orange demon whose purpose in life is to soup up cars, boats, and whatever other modes of transportation that happen to be nearby, Grim Fandango is full of memorable names, faces, and moments. 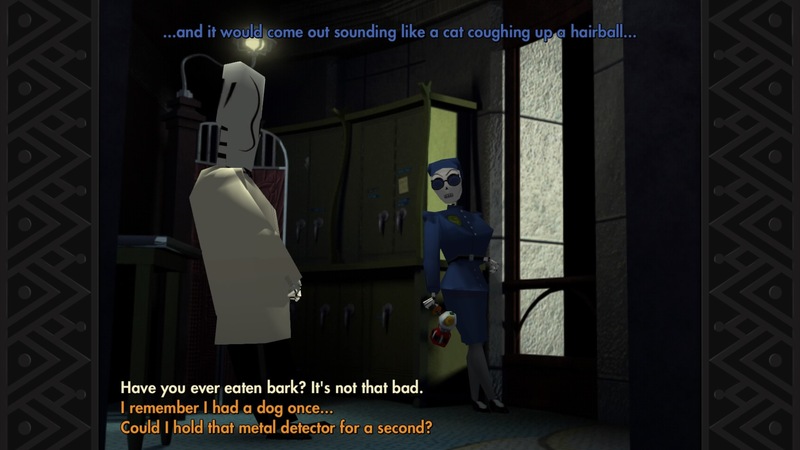 Grim Fandango’s character dialogue is a delight, and by far the highlight of the game. There are heaps of wordplay or sarcasm in every conversation, but it’s pulled off without feeling ingenuine. It’s like the whole world is playing along with the same joke, and you get to laugh along with them. Some jokes don’t always connect (I’m still trying to figure out where the revolutionary worker bees fit into the game’s largely Latin American lore), but I can forgive most misfires due to the game’s consistent cleverness and wit. A Remastered edition wouldn’t be complete without some fine-tuned changes. Most of these are limited to audio and visuals. 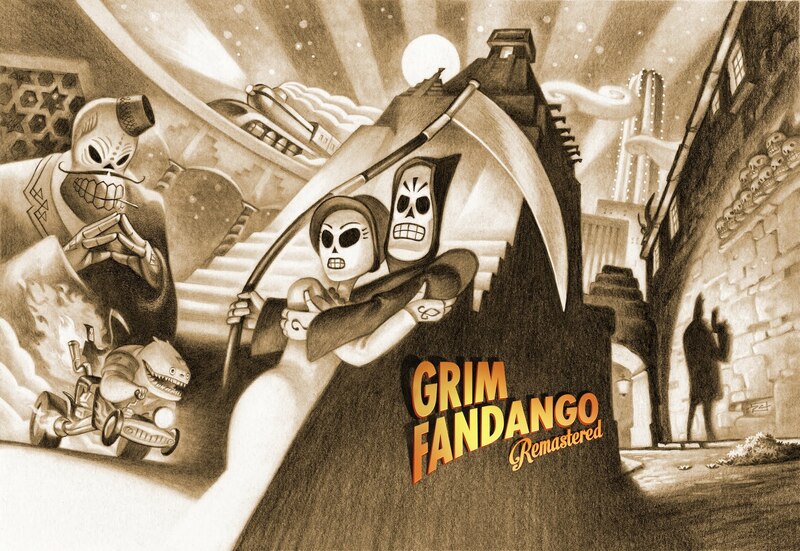 Grim Fandango’s original score has been replaced with an orchestral one that captures the game’s noir feel. Jazzy saxophone notes blossom out of dark alleys, which are enhanced by new lighting technology. 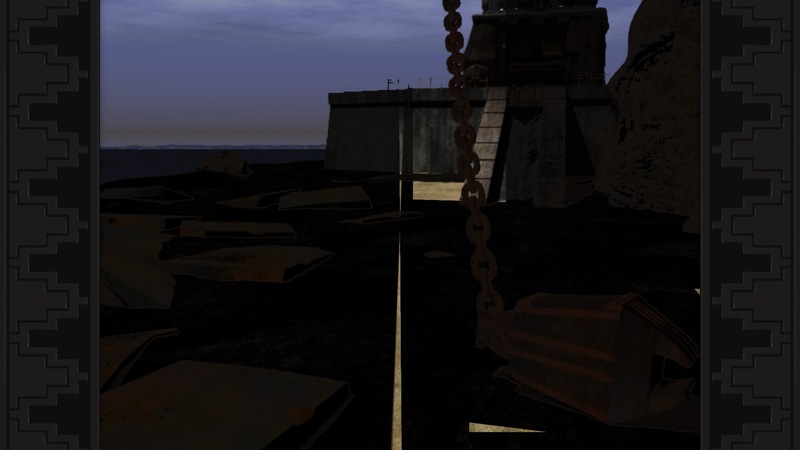 The original game featured 3D models moving around pre-rendered backgrounds. The 3D has been given an overhaul for the remastered version, and they look and control smoothly for the most part. Environments, while prettified thanks to the new tech, show their age even in this remaster. I encountered a few rough spots where Manny would get caught on some invisible boundary. My worst clash with the environment involved a crane on a beach that really didn’t like the way I was moving around; the environment got stuck and the colors darkened, like the game was trying to overlap two different screens. I could hear myself moving around, but I couldn’t see what I was doing, and it took several moments of just moving around to get unstuck. Grim Fandango occasionally gets gross in the graphics department. Yuck. Certain areas were tough to interact with as well (ladders were hard to find in almost every instance), but that’s always been a flaw of using pre-rendered backgrounds. The environments are generally easy to navigate due to the well-placed lighting, but sometimes the transition between two screens is rough. Other times I got locked into an animation when getting too close to a door, or worse, an elevator with a short cinematic attached. Nothing too serious, but a pain when I was trying to make some good progress. These graphical and engine misfortunes prove the game could have used some extra polish, but I thankfully never encountered anything game-breaking. Now for the bad news: I have as much praise for the writing and worldbuilding of Grim Fandango as I have condemnation for its puzzles. It’s easy to dismiss them on account of the game’s age; obtuse, item-heavy puzzles were the norm for adventure games back in 1998. Sure, some adventure games like the rebooted King’s Quest series have brought back these elements to modern games, but it’s a shame that Grim Fandango’s puzzles specifically have to exist in the 21st century. I can’t complain too much; I did use a guide. 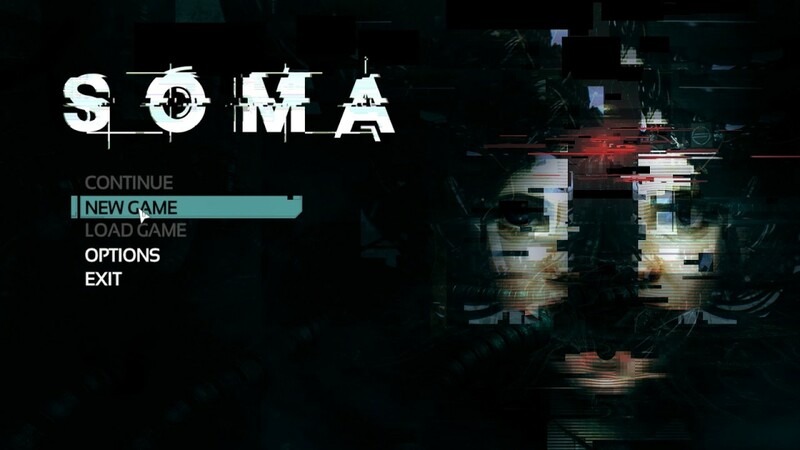 But I didn’t feel good about it, and for a game that has so much else going for it that’s fun to discover, the puzzles were a major killjoy. One of the game’s most charming dialogue scenes is connected to one of its most asinine puzzles. The biggest bummer about the puzzles is most of them feel so far removed from the unique, intriguing world that it feels like a tragic, wasted opportunity. Instead of picking up items that could interact in interesting ways and could flesh out the world even more, you’re using a wheelbarrow to plug up some pipes, which will stop a hydraulic pump. Or you’re giving a blackmail photograph to a lawyer, so he can release a revolutionary bee, so you can get the tools you need to board a ship. You are also rarely given any context for why you’re doing the asinine things you’re doing, which leaves you to bash your entire inventory against itself and every other thing in the game to progress. If I can say one good thing about the puzzles, it’s that the things you do are rarely acknowledged. No one points out how ridiculous it is that you’re jumping through so many hoops just to trigger some event, so it’s easy to think from a narrative standpoint that they didn’t happen at all. I wish Grim Fandango had gotten the full remake treatment, rather than a mostly graphical facelift. Its whimsical, compelling story makes it more than worthy for a playthrough, even in today’s gaming landscape, but with such archaic mechanics getting in the way of the otherwise well-plotted story beats, I have to wonder why a remaster was even necessary. Am I glad Grim Fandango got remastered? Yes, because people like me who missed it the first time around got to experience what many consider to be a classic title. As far as I know, there’s no digital release of the original game on Steam or GOG. All I can say is if I’d had the original version instead, perhaps I’d have been more accepting of its faults, as I have with other old titles. Grim Fandango is not one of the best games I’ve ever played. 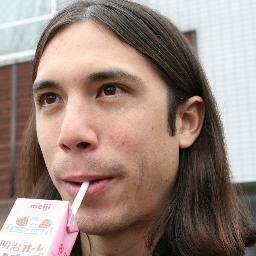 It might be one of my personal worst — at least in regards to what I want to be doing in a game. But is it one of the best stories in a game? Absolutely. If ever there was a game that deserves the game movie treatment, it’s Grim Fandango. Even using a guide, getting to this screen was an ordeal for me. Putting my final thoughts down made me realize: I’m not the audience this remastered game was for. I found it frustrating, but those looking for a 10-hour nostalgia dose will no doubt enjoy themselves. I can just imagine the thrill of recalling the solutions to old puzzles, like putting the pieces of childhood memories back together, one balloon animal and ticket printer at a time. That at least would have been much more fun than my time Grim Fandango Remastered.